I’m back online! Here’s a glimpse of my finished street-art! I will post the rest later BUT I just experienced Hurricane Arthur and wanted to post about that…I did end up doodleing a lot because of our long power outage. Many trees fell from a combination of sustained winds and heavy rainfall (which compromised the ground structure). Here’s a look at some uprooted trees I came across the following morning. The power had gone out during the storm. 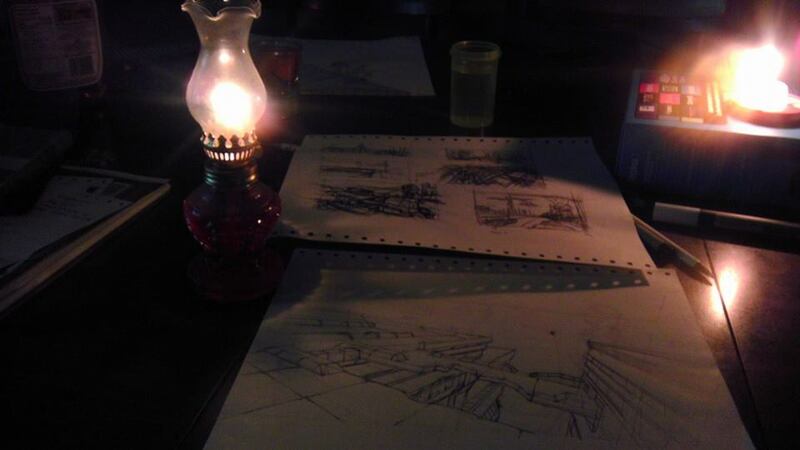 When night came we brought out candles and oil lamps. Boredom soon struck and I had a strong urge to draw. I found it a bit tricky in dim lighting…especially since I decided to work on thumbnails based on rough perspective lines that I drew and quickly couldn’t couldn’t see! This photo actually let in more light than what I could physically decipher. Paper, pencils, and cards kept us entertained: Below we each started doodling creatures/characters. I came up with Sheila, hehe. Anyways, I’m back online now. It is neat how quickly you adjust to situations. It took me a while to realized that I could actually switch on a light switch to look for things again : P Next post will show before and after shots of my outdoor murals. Then off to a new art project! A lot of them are focused on certain topics (drawing or pastel art). But if you want a mix of things and create things from your imagination, you might want to try my illustration course. It’s currently full for this Fall, but I try to offer it a couple times during the year.